We’re still in the beginning stages of 2018, but a few notable social media events have already taken place. Snapchat has launched an update that threw the world into frenzy. Instagram still refuses to put the timeline back in chronological order. Facebook is changing the frequency in which companies and end users interact and Twitter doubled their character count. These changes weren’t just to inconvenience us or keep us on our toes. The more notable social media sites are changing their algorithms and the way they do business because aspects of social media as we know it are starting to change. From chatbots to augmented reality, welcome to the Social Media 2018. First up on our list of social trends for this year is one that many PR firms and ad agencies in Philadelphia and other major cities need to consider: Generation Z. For the past few years, Millennials have been the key demographic that social media marketers have made the focal point of their attention. However, the tastes and desires of Generation Z are going to greatly change the way marketers need to communicate with their audiences. Generation Z, those aging 2 – 19 are much more active on social media than their predecessors. While we don’t see 2 year olds on Twitter, the stats show that Gen Z is in large part responsible for the success of online videos. An overwhelming 81% report interacting with at least one online video a day, a number that is higher than Millennials. As Generation Z begins to graduate school and enter the workforce, their buying power will increase, thus making their social media influence and voice greater. Next on our list of social trends to watch for this year includes one that made its appearance in 2016, but is starting to take shape even more: Chatbots. Have you ever visited a site, maybe a car dealership and within seconds of entering the website, a chat appears with a friendly face asking. “How can I help you today”? That’s an example of a chatbot and they are becoming increasingly prevalent. More brands are looking to utilize chatbots to help automate the communication process. More than 100,000 chatbots were used by different brands on Facebook in 2017. Effective communication between brand and consumer is going to be a major social trend going forward as the technology improves. It won’t be uncommon to see this on future lists to come as it advances. Finally, as the trend for seamless communication for brands and their audiences continues, so does one more thing: Brand Social Awareness. Social media has made it hard for anyone to do anything in private. Small typos can become big PR mistakes. Must we remind you of the Yahoo and “bigger Navy” incident? 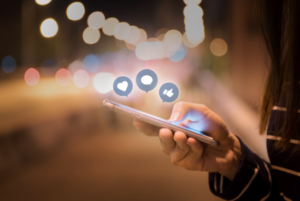 The 24/7 visibility of brands on social media has forced brands to become more accountable for their message, products, and strategies going forward. While some companies have been able to bounce back from their social nightmares, others have chosen to delete their social presence completely. In this day and age, being a brand without a social presence isn’t a brand at all. 2018 will the see the rise of the socially aware social media user and the socially accountable brand all at once. Even though this year is in full swing, these are still major trends that we can expect to see develop as the year progresses. Be sure to keep your social strategy updated and your social listening tools always plugged in. Social media can only be predicted but so much, and like consumers, tastes and trends change like the wind.